Drizzle a drop of oil in a pan. If using Jeera, make a tadka and add onion. Sauté till its transparent and add red chili powder, salt and chat masala powder to it. Switch off the stove and add sprouts. ( If we keep frying sprouts with heat on, the sprouts become hard and rubbery.) Add lettuce or cabbage generously and squeeze in lemon juice for that tangy taste. 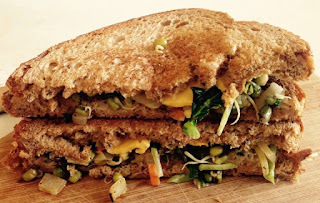 In a tawa or sandwich maker, make the sandwich by stuffing the sprouts mix.